Conversations on climate change have dominated global airwaves over the past few decades, with its impact overshadowing all aspects of our lives. Despite its ubiquitous presence today, any attempt to link climate change to sport might well raise some eyebrows. How can climate change possibly affect how we play football, tennis, cricket, or indeed, our enjoyment of them, one might ask. To many people playing sports is an abiding passion. Exercising is their way of keeping healthy. In addition, sport has become an important source of revenue generation and can ensure a significant impact on the economy of countries. However, given the climate threats that are already visible on the horizon, it is quite possible that we might one day soon have to alter the way we play sports, or even limit certain sports to specific geographical areas. Globally, 70 per cent of coastal cities that are economic and sports hubs are now under increasing threat of tidal waves and rising sea levels as a direct outcome of a hotter earth. As a rule, during wars, crises, or natural disasters, some regions call a halt to playing sports officially. Once the eventuality has passed, things usually go back to normal. However, when it comes to climate change, its impacts only intensify and become more dramatic over time. Today, there are nearly 400 extreme weather events occurring every year around the world. These events take their toll on the physical infrastructure of countries, destroying pitches and stadiums and altering the face of sport beyond recognition. According to international climate studies, cyclones and the growing prevalence of rainstorms have led to the disappearance of vast swaths of green spaces and playgrounds that are so vital for practicing golf, cricket and other sports. In recent years, the scorching weather in traditionally temperate regions has taken its toll on one of the most popular games in the world — football, with the training schedules of footballers being systematically shortened due to prolonged heatwaves and the players’ inability to practice in hotter-than-usual conditions. Likewise, in tennis, rules that applied over several decades in the past have recently been altered to factor in the changing weather patterns. At the US Open Tennis Championship 2019, male players were allowed to take short breaks during the match for the first time. 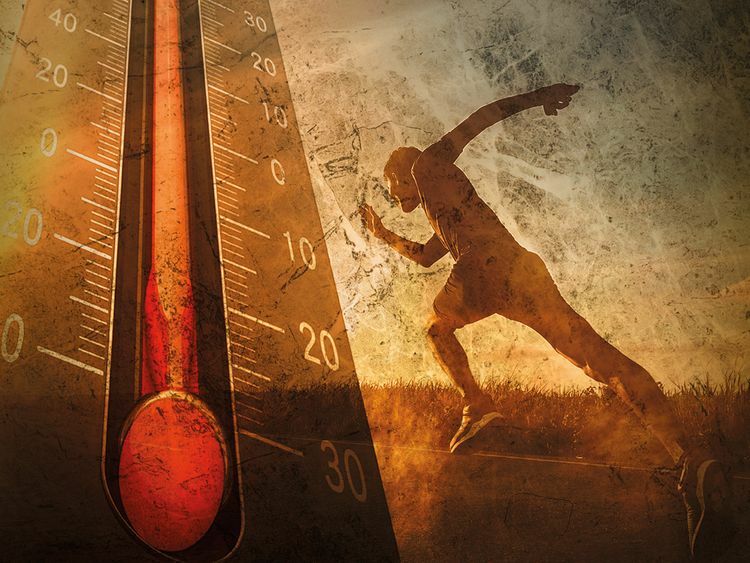 During the Australian Open 2019, a ‘heat stress scale’ replaced the traditional ‘wet bulb index’ to measure temperature as part of a new Extreme Heat Policy. To ensure the well-being of the players, all matches on outer courts were suspended if the heat stress scale reached its maximum five-point mark. Globally, 70 per cent of coastal cities that are economic and sports hubs are now under increasing threat of tidal waves and rising sea levels as a direct outcome of a hotter earth. The infrastructure of these cities is at grave risk of being swept away, taking all sports events, particularly water sports in its wake. Undeniably, to properly address climate change, everyone must be on-board. Governments, private businesses, and the community at large must join forces as one to mitigate the causes of climate change and reduce our carbon footprint. The UAE fully understands the importance of adopting policies for a sustainable future. The Ministry of Climate Change and Environment partnered with the Higher Committee of the Special Olympics World Games Abu Dhabi 2019 and private entities in March to launch a joint initiative to offset the Games’ carbon footprint through encouraging the public to cultivate local plants. While this might seem a small effort in the greater scheme of things, one needs to remember that it is the little drops of water that make the mighty ocean. Thani Ahmed Al Zeyoudi is UAE Minister of Climate Change and Environment.